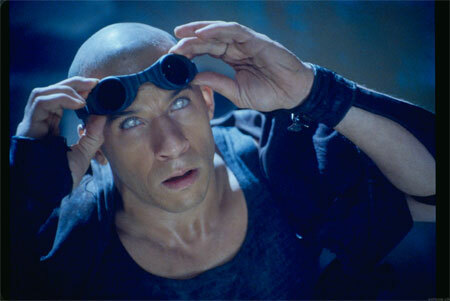 Riddick-contacts are the type worn by Vin Diesel in Pitch Black and The Chronicles of Riddick. Also known as mirrored contact lenses, they are a reflective contact lens that covers the iris. Some lenses cover the pupil and actually offer UV protection as a result. In Pitch Black, Riddick (Vin Diesel) undergoes eye surgery to give him night vision. This gives his eyes a reflective property (and looks wicked awesome). There are a few sites that sell Riddick contact lenses, but they are purely theatrical lenses and offer no vision correction whatsoever. Before Riddick came along, they were popular among sports players and cyclists as UV protective lenses, before then they were used purely as theatrical lenses and were not sold to the public. A simple Google search will produce a few websites that sell pairs of mirrored lenses, but be prepared to pay a heavy price for them. The more ‘legit’ sites will sell them for over $100, and some sites that aren’t as professional can sell them for cheaper (I’d order expensive). As always, check with your eye doctor first to make sure that you can wear theatrical lenses before placing an expensive order, and ask their advice for choosing an appropriate website and supplier.